Trailed Urea Booms from Ashmore Engineering have been designed and manufactured to guarantee precise and even application of urea. 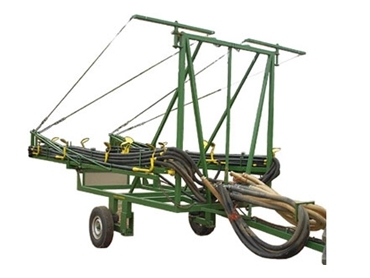 The Trailed Booms can be attached to pre-existing an air seeder cart, and evenly distributes urea granules through cable supported wings to a spreading width in the excess of 100 feet. Ashmore’s Boom also features a hydraulic fold and latch system that can be operated from the tractor cabin. The 100 x 100 x 5 RHS frame is heavy duty and the systems distributors are manufactured from stainless steel. Wheel track manufactured to be compatible with air cart wheel tracks.